Learning to cook a new cuisine can seem daunting, but probably not as daunting as cutting back on your monthly takeout budget. Luckily, by adding some of these ingredients to your shopping list, it’ll be easier than ever to add your favorite Thai flavors to dishes you already love. Whether you marinate some pork chops in red curry paste and coconut milk, add a dash of fish sauce to the slow-cooker next time you make beef stew or go all in and tackle the perfect pad thai, having some of these essential Thai ingredients in your kitchen will make life a whole lot tastier. Fermented, salty and funky, fish sauce is the backbone of Thai cuisine. 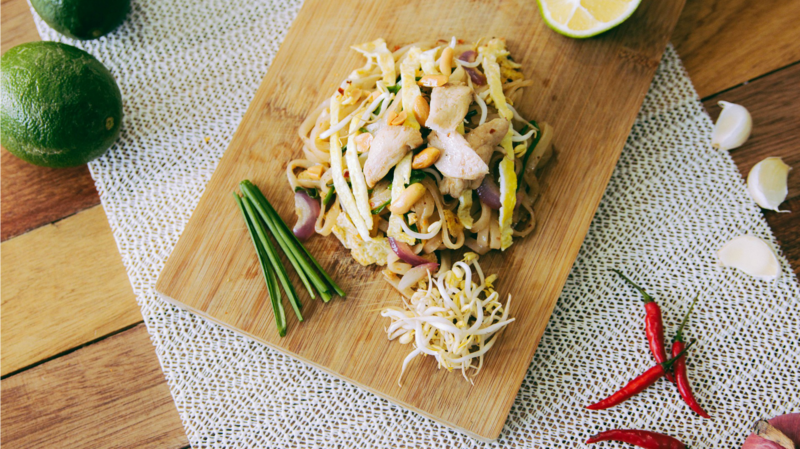 Its smell alone may be off-putting, but once it’s cooked and combined with other robust Thai ingredients, it adds a deep umami flavor to your food. If you don’t eat fish, you can substitute light soy sauce or golden mountain sauce, a fermented soy product. Fragrant makrut lime leaves are used to season dishes similarly to bay leaf — most of the time you remove the leaves once the dish is cooked. If you can get your hands on makrut lime leaves, stock up and keep them in the freezer. You can try dried makrut lime leaves, too. If not, try subbing lime zest in recipes that call for the ingredient. Often substituted with ginger in the U.S., galangal is an aromatic rhizome that tastes like a citrusy ginger. If you can’t find it fresh, dried will do. Small but potent, Thai bird chiles pack a fiery punch. You can find them at the grocery store, Asian markets or the farmers market — but if you strike out there, you can substitute them with serrano peppers. From curry pastes to stir fries, having garlic on hand is essential to recreating your favorite Thai dishes. Sliced thinly and tossed with aromatic salads or ground in a mortar and pestle with herbs and chiles to make curry paste, shallots are an easy-to-find essential Thai ingredient. More pungent than the Italian basil you’re probably familiar with, Thai basil has notes of anise and licorice, and is incredibly fragrant. You can substitute it with Italian basil in a pinch, or a combo of fresh Italian basil and dried Thai basil. Used as a garnish or added to soups and stews, fragrant cilantro is a commonly used herb in Thai cooking. Find fresh cilantro, or tubed cilantro paste, at most large grocery stores. You can make red, green, panang and yellow curry pastes at home… but if we’re being realistic, it doesn’t hurt to have a jar or two of the pre-made stuff around for busy nights. Stir fry veggies, meat or tofu with a spoonful of curry paste for a quick meal, or simmer with coconut milk for a flavorful stew. Springy rice noodles are the backbone of dishes like pad thai and pad see ew. Most are simply soaked in hot water until softened, then stir-fried. Check the international aisle of your grocery store for Thai rice noodles or look online. Tamarind, a tart-sweet fruit pulp, can usually be purchased as a paste or in a concentrated liquid form. Some recipes use lime mixed with brown sugar, or ketchup, as a substitute for tamarind. The reduced sap of a palm flower, palm sugar adds a depth of sweetness not attained with refined white sugar. If you can’t find palm sugar, try coconut sugar, brown sugar or maple sugar instead. Lemongrass is a highly fragrant herb that, you guessed it, smells like lemons. Lemongrass is added to curry pastes, as well as to soups and stir-fries. You can find fresh lemongrass at some grocery stores and Asian markets. Also check for lemongrass paste in a tube by the herbs at your grocery store, or frozen lemon grass in the freezer aisle. Creamy, slightly sweet coconut milk is found in many Thai dishes, from curries to soups. Coconut milk helps temper the fire of Thai chilies and curry pastes while balancing sour and herbal notes, too. Canned coconut milk should be easy to find in your grocery store — check the international aisle.